Roger Bannister of England was the first to break the 4 minute mile barrier in 1954. Fifty years ago last week, teenager Jim Ryun of Wichita, KS, was the first high school boy to break the mythical barrier. The mile has become the measure of running accomplishments in America, but there were very few Mile races across the country until recently. I didn’t run track seriously as a kid growing up. I had to run the mile in middle school testing for the Presidents Fitness Award. In college after taking to jogging I ran a 2 mile time trial in a low key running class. But I had never raced a mile race until I moved to Boulder and discovered the fun and excitement of the Pearl Street Mile. There is some debate on if we should even care about the Mile as an event, and why not just convert to metric all together. Ryan Lamppa has this to counter, “The Mile is ‘America’s distance’. This country understands miles and miles per hour,” After all, even in timing for a 10k event, results may display your average pace per mile. Most high schools in America run the 1,600, or four laps around a 400 meter track. That’s the size of most U.S. high school tracks that have been built or retrofitted since the metric movement. Four laps, the classic mile distance, makes everyone think a 1,600 is a mile, but Jim Gerweck, a high school track coach in Wilton, Connecticut, says everyone is wrong. JIM GERWECK: It’s almost like false advertising right, how they’re running an event that everybody is calling the mile but it’s not. GOLDMAN: 1,600 meters actually is 9.344 three meters less than a mile – seems silly to quibble over 9.344 meters, but Gerweck says the disparity devalues high school track records. GERWECK: Four minutes for high school boys or five minutes for high school girls – those are, you know, significant barriers. And if a kid breaks one of those for 1,600, they’ll talk and brag about having broken five minutes for the mile, but they really haven’t. There is something approachable and achievable in the mile. The race is hard, but its over quickly. Its achievable for both adults and kids alike. Boulder’s Jenny Simpson likes the distance as she is able to focus intently, “You must be able to react at any moment and go with the flow,” she mentioned at the Boulder USA XC kickoff last December. For the everyday athlete, whether training for a 5k or a marathon, the mile is something everyone can test themselves with. “The mile is a fun race that everyday athletes should not consign to the elite, college or high school category. It will help get you out of your comfort zone, give you a baseline on fitness and max heart rate (that can also be used to estimate Lactate Threshold and HR zones). It will also act as a great alternative workout that will help you to learn how to push yourself while developing form, efficiency and leg speed/turnover,” encourages Ewen North, Director Head Coach for Revolution Running. There are several opportunities to test yourself this summer starting next week at the Boulder Road Runners All-Comers Track Meet held on Thursday June 19. This Thursday night’s meet will be a special treat as the evening will start at 5:30 pm to celebrate Olympic Day. All events are $5 for non-BRR members. The mile will be run at 6:20 pm. 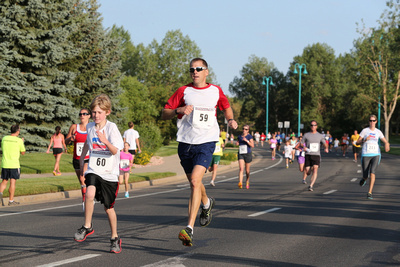 Next up are the Superior Downhill Mile on July 4 and the Downtown Race Series Pearl Street Mile Wednesday July 9. Both races are family friendly with post race celebrations. Follow the #BringBackTheMile #IamTheMile movement on twitter.